It’s almost here -after months of work, “Be Safe Love Mom..” will be out on store shelves on Tuesday, March 31. It’s been a lot of dreaming, rewriting, effort, and tears to put this military mom journey down on paper. Maybe that just describes our lives as moms too-except maybe the rewriting part. When that first baby of mine was placed in my arms it was overwhelming. I had had several miscarriages and was almost frantic with the thought that I might never be a mom. He was late-quite late and was in fetal distress when I finally delivered him. Watching the team resuscitate that blue baby I felt like I was having an out of body experience. Time stood still. Then I heard it -a wail and he turned pink. He was here! My son was finally here in my arms. I was determined to be the best mom I could be. I had big dreams for my babies. As more children filled the nest the definition of being a good mom changed a bit. Clothes folded in drawers became clothes sorted into laundry baskets. Matching socks were optional.That stuff was minor. I wanted to focus on a higher calling. I poured my heart into raising humans with integrity and a sense of purpose. Along the way they began to dream their own dreams. I relished my new role as “Dreamkeeper.” You want to be Top Gun? Of course that is possible. You want to climb to Everest Base Camp? Why not? (all true and described in the book:) Work hard, do your best and keep trying. Reach for excellence. The rest of the story if you have read “THE BOOK”…all four chose military service as a way to fulfill their dreams. Just like I marveled with that first baby in my arms, I am in awe of all they have accomplished. It is such a privilege to watch dreams come true. This week my dream is also coming true. I wanted to write a book to reach out to my fellow moms, to encourage and inspire them through the tough times. I wanted the extended community to understand and appreciate the sacrifices of those who love someone in service. I wanted people to come together to find resources to make sure our children’s needs are met now and in the future. After a long season of work and waiting it is finally here. Eight virtual deployments-I call them virtual because my children never deploy without me. Time stands still until they are home again. Now the waiting is almost over and I will soon have my son in my arms again. And then the next one will leave and the cycle repeats. But in this moment of time, there is a lot to celebrate. It is wonderful to do that with other military moms who understand. 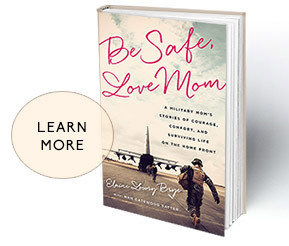 So if you are in a bookstore, or a Costco, or a Target somewhere and you see a woman clutching “Be Safe Love Mom: A Military Mom’s Stories of Courage, Comfort, and Surviving Life on the Homefront” with tears streaming down her face-yes that’s probably me. Tears of joy folks-tears of pure joy…..
Can’t wait to read your book! I’ve been following you on some Facebook pages and am so happy for you. Congratulations! Elaine is the BEST . . . she knows from experience what she’s talking about, and she tells it from her heart.